The blue Audeze Mobius is a fully immersive 3D cinematic audio and head tracking-enabled headphone designed specifically for gamers, audiophiles, cinephiles, or anyone looking for high-resolution audio. By harnessing Audeze's planar magnetic technologies, the Mobius unlocks the full potential of gaming audio, movies, music, and more. The headphones are fully integrated with 360° surround sound functionality and provide an awe-inspiring cinematic experience that one would expect from a high-definition theater. The Mobius headphones use Waves Nx technology to enhance the realism of 3D audio and provide sound localization, integrated head tracking, and room emulation. 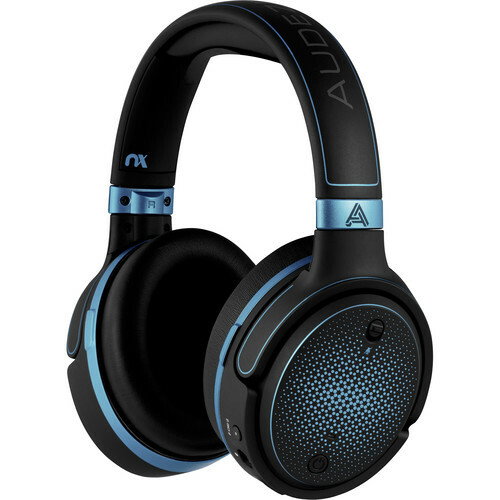 Other notable features include replaceable contoured memory-foam earpads, an adjustable memory-foam padded headband, wireless Bluetooth, and a flexible and detachable boom microphone with built-in noise attenuation, mute/unmute functionality, and independent volume controls that provide professional voice quality. The free Audeze HQ app allows you to fully customize your sound experience with HRTF customization and sound profile selection. An optional carrying case and headphone stand are also available separately. The Audeze Mobius headphones ship with the detachable microphone, two USB cables, and a 3.5mm analog audio cable. Box Dimensions (LxWxH) 9.1 x 9.1 x 4.6"